By Nicolaus Mills. New York: Rowman & Littlefield, 2015. ISBN 978-1-4422-3985-2. Photographs. Appendixes. Notes. Bibliography. Index. Pp. ix, 240. $37.00. For Army football fans the last several decades have been difficult, to say the least. Supporters of the Cadets who grew up watching the classic rivalry Army-Navy game on a black and white TV with their fathers, veterans of World War II and Korea, have had little to cheer about for years. Winning teams have become rare—witness the futility of the 2003 squad with a 0-13 record. The Midshipmen of Navy have dominated their Army opponents, winning the last thirteen games of the series. One must return to the past to celebrate an Army football triumph over Navy. Nicolaus Mills has done just that with his recent book Every Army Man is With You. The book is not only an account of the 1964 Army-Navy, but also, as the title suggests, the Army football team of that class who went on to fight in the Vietnam War after graduation. Mills tells this story by focusing on seven key players from the squad who bested Navy, and their Heisman Trophy winning quarterback Roger Staubach. By that year the Naval Academy had won the last five meetings with Army, back to 1959, causing considerable angst at the U.S. Military Academy. Football coach Dale Hall, who had the great misfortunate to replace one of the best collegiate football coaches in history, Earl “Red” Blaik, was replaced after three relatively unsuccessful seasons. Coach Paul Dietzel now faced the challenge of the Army-Navy game. Every Army Man is With You is an account of what followed in Army-Navy football, describing the drama and tension associated with a program in trouble, a coach struggling to keep his job, young football players attempting to defeat a historic rival, and young men facing an Army career that was to include service in a future war. The book is written in three parts: first, an introduction providing contextual background of the times, players, and academy; second, an overview of the November game as seen by the seven key Army players and their lives after football; and third, the aftermath, including several appendixes concerning Army football for readers unfamiliar with its rich history. In many respects, the broad, survey-like introduction of Army football, to include the seven player profiles, is the strength of the book. 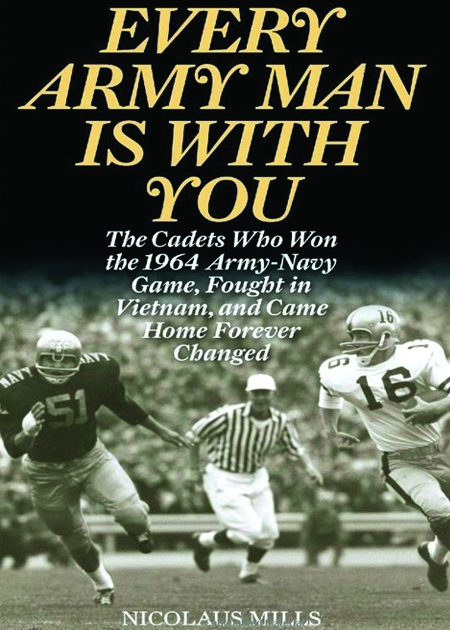 Every Army Man is with You is also a look back at a bygone era for our nation—for example, witness the 1964 Army football team photo in this book, with no minority players present, evidence that change was coming slowly at West Point before Vietnam. The book could have benefited from better historical proofreading, to include the errors describing the Army Air Corps in 1945 as the “Air Force,” and General Douglas MacArthur being awarded his varsity “A” for managing the Army football team as a cadet, when it was for his credible play in left field for the varsity baseball team, including his participation in the first ever Army-Navy baseball game in 1901, won by Army. At times, Mills also seems to overstate his cause and effect analysis of historical events to include the publication of The Pentagon Papers in 1971, and President George W. Bush/Secretary Donald Rumsfeld/General Eric K. Shinseki disagreements over the Iraq War, in an attempt to prove that mistakes were made, and participants in war are forever changed by the experience. Both seem rather evident and detract from the account. However, the book is well resourced and noted by Mills. Every Army Man is with You is recommended for readers interested in Army football and a look back to an era when the Army-Navy football rivalry routinely captivated a nation.